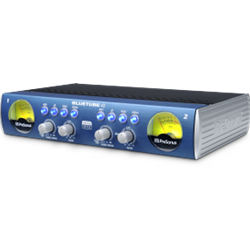 PreSonus’ popular Class A XMAX preamps are widely lauded for their clarity and transparency. Our tube preamps are beloved for their warm, smooth sound. With the Blue Tube DP V2 dual-path mic/instrument preamp, you get both types of high-quality sound in one unit. No wonder the original BlueTube DP became a classic! Now we’ve improved on the classic unit with the BlueTube DP V2. The solid-state path now feeds PreSonus’ top-of-the-line Class A XMAX™ mic preamplifier with 80 dB of variable gain—an upgrade from the original BlueTube DP’s solid-state stage. The tube path features a 12AX7 tube that operates on voltages double that of other preamplifiers in its class, producing lots of headroom and big tone. We’ve done an assortment of other tweaks as well. The result: Our BlueTube DP V2 offers lower noise, more high-end clarity, and an even smoother tube sound than its predecessor. You still get all the secondary features you expect in a professional-grade preamp: 48V phantom power, an 80 Hz high-pass filter, -20 dB pad to control hot input signals, and a polarity-reverse switch. Each channel has an illuminated VU meter so you can visually monitor your input levels. With two combo mic/instrument inputs, the half-rackspace BlueTube DP V2 is a great choice for guitars and basses as well as for vocals. Singer-songwriters can run their vocal through one channel and their guitar through the other, feeding both to the P.A.—no guitar amp needed. It also serves as a DI box, thanks to balanced XLR and unbalanced ¼” outputs, and is housed in a new, rugged, 1/2U case. Try the BlueTube DP V2 as a front end for a DAW, too; sure, your recording interface might already include preamps, but few of them give you both tube and solid-state operation. We have also updated the preamp’s compact, rugged enclosure; it has more rounded edges and looks modern and sleek. It can be used as a desktop unit or it can be screw-mounted to a standard rack tray. And despite the improvements, we deliver the BlueTube DP V2 for essentially the same price as the original BlueTube DP. So get the new and improved version of the most versatile, best-sounding mic/instrument preamplifier in its price range: the BlueTube DP V2.